The general consensus seems to be that 2016 was a bad year. This is just a blog about Phuket, I don't want to talk politics or get all sentimental, but ... well, Brexit was dumb, voting for Trump was dumber, the world continues to fight and terrorists who will never actually win continue to kill random innocent people. And people get more upset about the death of a pop star than the death of children in Syria. But this is just a blog about Phuket. How was 2016 here? Well, pretty good really ... life goes on. This blog is now more than 10 years old, I am still managing a dive shop and watching my kids grow up and we try to do lots of family activities. We tried 2 times to take a long road trip up to the North of Thailand .. in April we were thwarted by extreme hot weather and haze, plus a builder who took a lot longer to finish work on our house than he'd promised! And in October, we wanted to try the long drive again but our daughter got sick. Plus, and this was the big Thai news, King Bhumibol (King Rama IX) passed away on October 13th. So it was not an ideal year, but here's my annual yearly review of what was featured on Jamie's Phuket last year, 2016. 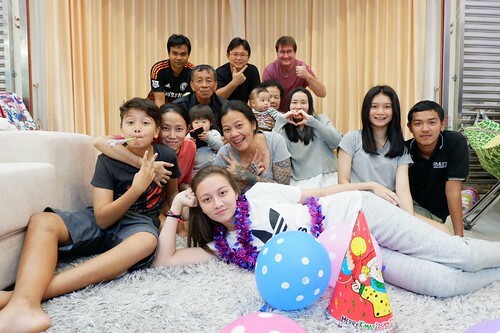 (above) Starting at the very end of the year ... all the Thai family. We all met in Chumphon (400km north of Phuket) for New Year. I drove up on 31st December and drove back on 1st January! Very nice to see all the family, all in one place at the same time! Happy New Year 2017! I have a good feeling about this year. And now back to 1 year ago, January 2016. The first blog post of 2016 was a review of 2015 :) But we soon got out exploring and taking advantage of the very nice weather. It hardly rained for a couple of months in January and February. 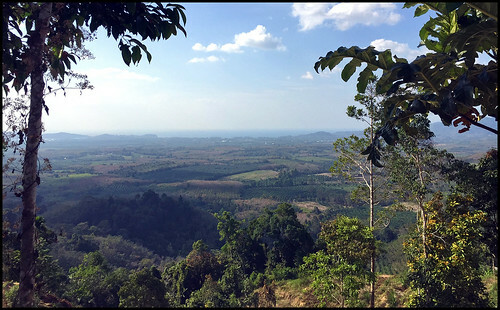 We went looking for a viewpoint in Phang Nga in between Phuket and Khao Lak. We found Khao Kai Nui and still plan to go back, but the drive up was a bit scary! 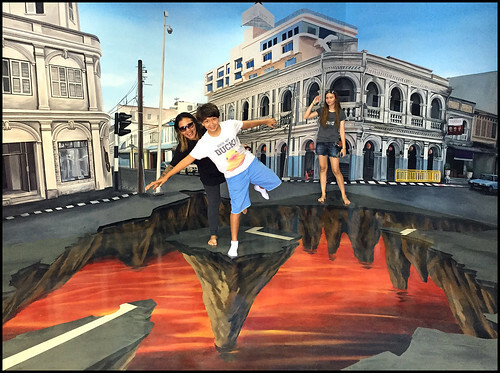 Also in January we did a more "touristy" thing and visited the 3D "Trickeye Museum" in Phuket Town. No idea why it's called a museum. I think someone just got mixed up between museum and gallery. These places have become quite popular in Thailand in recent years. Lots of 3D art .. you pose and take a photo. Lots of photos. Well, it was a bit of family fun! Quite a lot of restaurant posts on the blog in 2016, which I hope will continue in 2017! There should be more, but we do tend to have a few favourites and I admit we don't try new restaurants often enough. 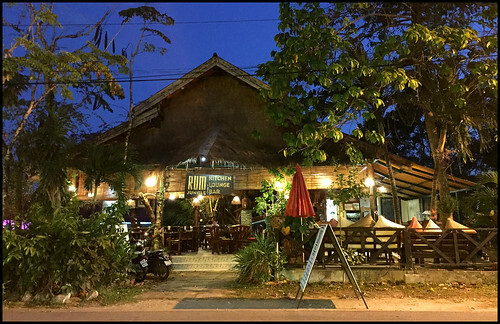 We ate a few times at Rum Jungle which is in the Naiharn area, and is a bit above our normal budget, but is very good! I had my birthday dinner there. Yes, not cheap, but .. might have my birthday dinner there again in 2017! 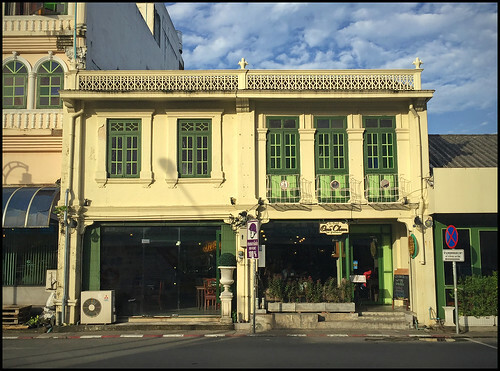 And I updated the blog posts on a couple of favourite restaurants ... Kopitiam in old Phuket Town and The Big Chicken in Kathu. As we live in the Kathu area, we often eat around Kathu and the town. 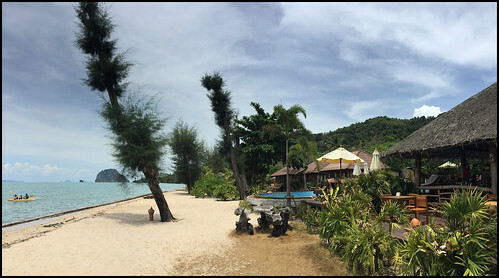 For more restaurant suggestions see : Phuket Restaurants. There was a bit of a lack of new, exciting days out in the high season. I normally work 6 days per week and look forward to a bit more free time and some holidays from May to October! We had a very nice weekend trip at the end of April to Koh Yao Yai Island, stopping off at other islands on the way. We have been to Koh Yao Noi several times, but this was our first trip the bigger of the Koh Yao islands. And we did more exploring in May. I'd seen this new viewpoint on Instagram, so we went looking for it - Samet Nangshe Viewpoint has quickly become very popular and I hope will not be spoiled. The view is amazing and we do intend to visit again soon for a sunrise view. Anyway. Wow! More restaurants! First, one in the "business district" just outside Phuket Town, next to the Index mall. We have eaten at Zaab Tae Tae quite a few times this year. Not a place for Western food. They mostly do Isaan food, and plenty of spicy stuff. Guaranteed to tickle the taste buds! And then, one day the kids really really wanted pizza. We tried a place called Caffeine which is close to the aforementioned Big Chicken. Very good pizza! 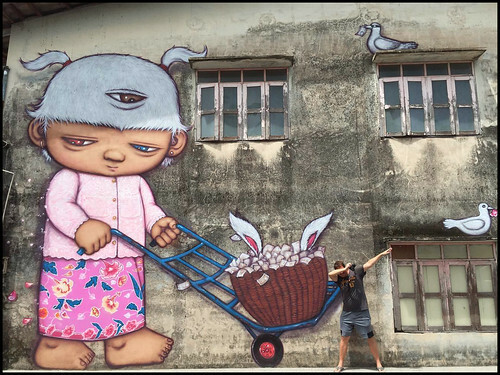 Into the low season, in June we went looking at all the new street art that had appeared around old Phuket Town. And this needs updating again, the town is getting arty! I found time to revisit Laem Ka Beach, close to Rawai Beach. I had not been for many years. I hear that it gets busy in high season, but in June it was almost deserted! 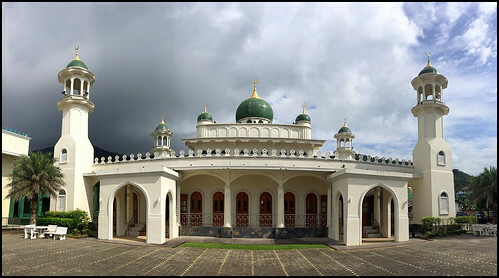 Also in low season, I managed to blog about Mosques in Phuket. I had meant to do this for a while, and took several drives around the island to take photos of mosques. There were more than I realised! We finally tried the very good One Chun restaurant in Phuket Town - very good local Thai food. We ate there a couple of times including our daughter's birthday. It got very popular, probably not due to this blog .. another couple of times we thought about eating there, but it looked too full for us. I don't like getting shoehorned into a restaurant no matter how good the food is! More exploring in July - we had seen the Little Amazon tour before. 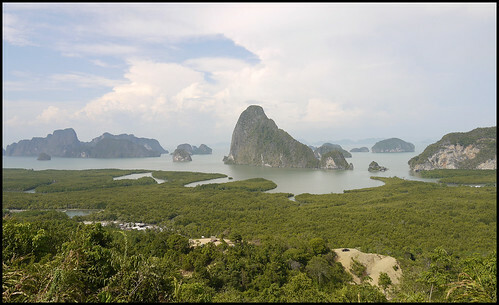 It's north of Phuket, near the town of Takua Pa in Phang Nga Province. 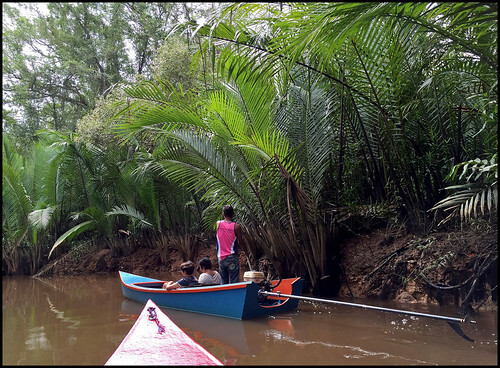 A boat ride down a tiny, jungly river, onto a bigger river .. and I guess you can imagine that it's the Amazon (on a smaller scale!) We enjoyed the trip. (above) On the Little Amazon tour. Another new restaurant ... Maireab Zaap Ver is in Kathu not far from our house. The owners used to have a smaller place on the road to Kathu waterfall, but it closed years ago. We were happy to see them back. We have been eating here quite often! And a new market in Phuket too! 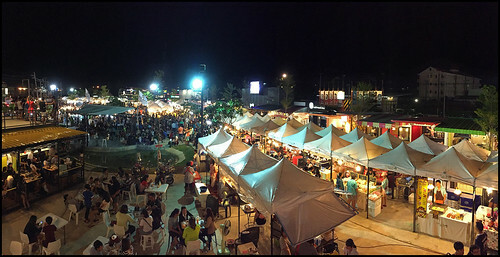 There are actually lots of markets in Phuket including several night markets. The new Chillva market opened in April 2016 and is the current trendy place to hang out! Lots of food, a few bars, lots of clothes and random stalls. More on the blog : Chillva Market. We keep on finding new places in Phang Nga Province just over the bridge from Phuket. 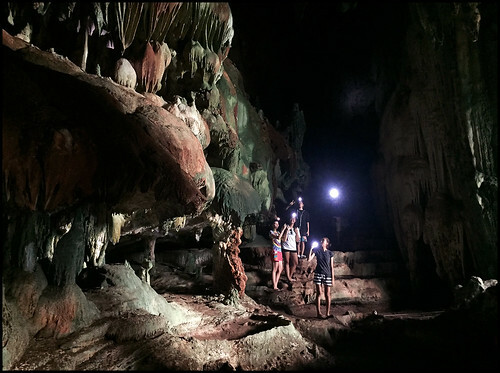 Phang Nga is way bigger and we like to explore. This year we found a "new" waterfall, and only 10km from the bridge, just north of Khok Kloi town. 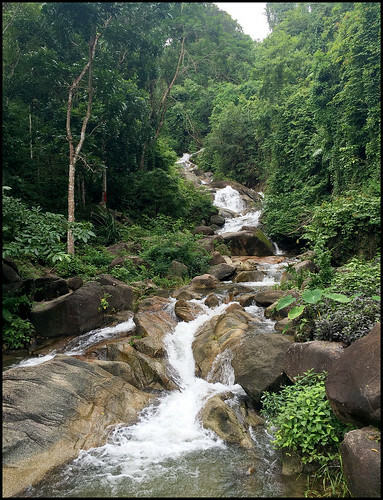 Wat Khao Waterfall is not the biggest, but very pretty in the rainy season, and not so big as to prevent swimming. Plus we found a good restaurant right next to the falls! Later in the year I had another trip to the UK to see Dad in the care home and to organise the selling of the family home. Tiring! I got back to Phuket just in time for the 2016 Phuket Vegetarian Festival which ran from 30th September - October 9th. 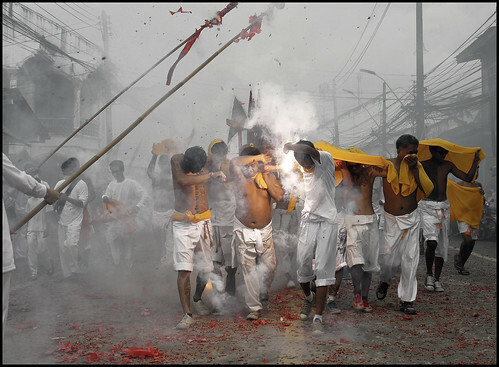 I did my usual 9 day diet and attended several of the street processions, although not as much as previous years. Still got lots of good photos! And then as the year grew old .. more exploring! We headed to the same area of Phang Nga as the Samet Nangshe Viewpoint where we'd seen a small fishing village back in 2015. Now this village has started a tour operation with longtail boats heading out to nearby islands, some with caves. We weren't quite sure what to expect, but it turned out to be one the best days of the year - read more @ Exploring Islands in Phang Nga Bay. As mentioned a bunch of times on this blog, I have friends with a tour company - Easy Day Thailand - who you can contact for all kinds of trips around Phuket. The trip we did in Phang Nga Bay was something they plan to turn into a tour and indeed we traveled with these guys to Koh Yao Yai island earlier in the year. 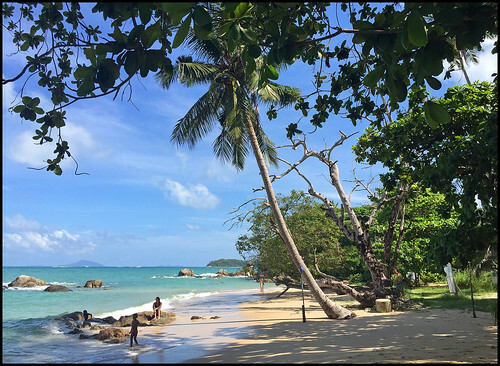 So with a bit of help from them I wrote a Top 10 Phuket Tours page on the blog, and it's well worth a read if you are not sure what to do around here! Last couple of blog posts in 2016 - more restaurants! We really like Nern Khao View Talay, which is close to Wat Khao Waterfall. We ate there a couple of times and went there for dinner on New Year's Day 2017 too! 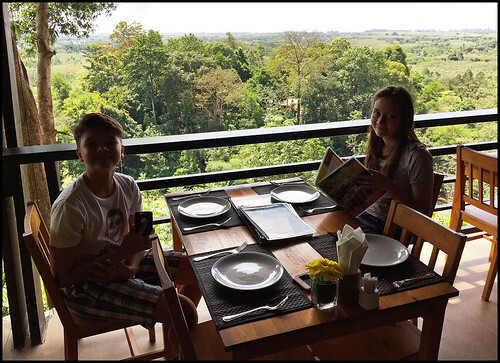 Bit of a drive from the south of Phuket of course, but if you are exploring Phang Nga and it happens to be lunch or dinner time, this has become a new favourite after just a couple of visits! And the last 2016 post was a small roadside eatery in the Karon Beach area, just over the street from where I work at Sunrise Divers. Have a look at Pim's Kitchen! I vow to keep trying new restaurants in 2017, partly for the variety, partly to have something to blog about! Slightly uncertain times in Thailand with a new King, and no exact date for new elections .. the coup was nearly 3 years ago. And yet tourism always seems to be unaffected! Phuket is not a perfect paradise, but I have no plans to leave, very much enjoy living here and exploring the area. The blog goes on! Any questions about Phuket, please do ask on the Facebook Page. And please do follow on Twitter and Instagram! And find lots more photos on Flickr. Here's to a happy 2017!